Walkers, runners, people in wheelchairs, and those using walkers and motorized carts — don’t stand a chance against a car or a truck. Motorists have no excuse for hitting pedestrians or otherwise causing injuries. If they do, it’s a lousy one, and we will knock it down in court. 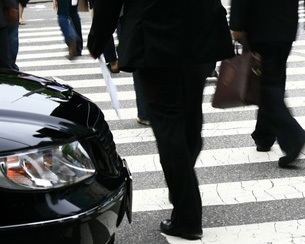 At Carluzzo Rochkind & Smith, P.C., our attorneys in Manassas have been representing pedestrian accident and other personal injury victims and their families for over 27 years in Manassas, Prince William, Manassas Park, Gainesville, Haymarket, Woodbridge, Lake Ridge, Dumfries, Bristow, Warrenton, Centreville, Fairfax, Stafford, Chantilly, Leesburg, Ashburn, Sterling, Herndon, Reston, Alexandria, Annandale, Arlington, and throughout Northern Virginia. Our team prepares each of our clients’ unique cases for trial from day one, and we are ready to fight for the full and fair compensation that you deserve. What Options Do Injured Pedestrians Have? Insurance companies will not offer you the full and fair value of your case. The compensation that you truly deserve can only be obtained through the tireless and passionate work of a committed personal injury lawyer. We will hold the responsible party accountable for negligence, and we will handle all legal aspects of your case. Our lawyers communicate with the insurance companies and all other adverse parties. Regardless of where and how you were injured, you should speak with an experienced lawyer immediately. What Is Full And Fair Compensation? If you were hit by a drunk, reckless or distracted driver, your chances of recovering punitive damages will be elevated. Our team will address all your legal options with you ahead of time and ensure that you are able to make fully informed decisions in your best interests as your legal case progresses. We will also help you secure compensation for present costs while your legal case is pending. For help, please contact us at 703-361-0776.